There Was a ‘Harry Potter’ Reunion Over the Weekend! 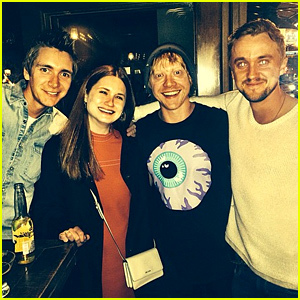 Tom Felton poses with his former Harry Potter co-stars James Phelps, Bonnie Wright, and Rupert Grint in this new picture posted to his Instagram account. “Kim K stood me up. Outnumbered by 3 Weasleys. Ugh.” Tom captioned the photo – LOL! Tom played Slytherin baddie Draco Malfoy in the series – a big nemesis of the Weasley family. Too funny. This isn’t the first time Tom won Instagram this past week. He wrote a pretty funny response to the Draco Malfoy/Kim Kardashian hair similarities.